Modern Germany, established as a nation in 1871 by the Treaty of Versailles following the Franco-Prussian War of 1870, suffered considerable territorial loss in the East as a result of defeats in World Wars I (area 180,999 sq. mi. in 1919) and World War II (136,462 sq. mi. 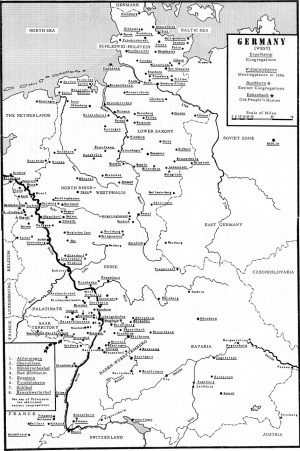 in 1946) and in mid-20th century had no territory east of the Oder-Neisse River line. All the German population, with small exceptions, living east of that line was evacuated or expelled westward and was added to the population of the truncated Republic of Germany, with a (1946) population of 65,151,019 excluding the Saar. All the Mennonites who had lived in Danzig and East and West Prussia, as well as those in the three congregations in Poland, were transported westward in this action, some of them later emigrating to Canada and Uruguay. 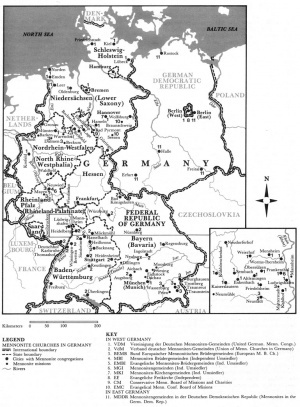 In 1956 the country was still divided into East Germany (Russian Zone) with a population of some 18,000,000, in which there were possibly a maximum of 800 Mennonites of former West Prussian residence, but no organized congregations or ordained ministers, and West Germany with about 47,000,000 and some 15,000 Mennonites (souls). The total number of baptized Mennonites in 1955 in Germany was about 11,500 in 60 congregations. Of these, 18 congregations with some 7,200 baptized members (total 8,700 souls) were in North Germany (above Frankfurt), 36 congregations were in South Germany with about 4,500 baptized members (5,400 souls), of which 18 are in the Palatinate and Hesse with 2,400 members, 9 were in Baden, 6 were in Württemberg, 8 were in Bavaria, and one in Frankfurt, these last 24 congregations having a total of 2,100 members. Of the congregations in North Germany 9 were refugee congregations of former Danzig-West Prussian origin established since 1945. Many such refugees also became members of the old established congregations in both North and South Germany. The German Mennonite congregations were all (except Frankfurt) members of one of two conferences: (1) Vereinigung der Deutschen Mennonitengemeinden, mostly North Germany with the Palatinate and Hesse, and (2) the Verband Badisch-Württembergisch-Bayrischer Mennonitengemeinden, almost all of whose congregations were in the three last indicated territories. In addition, the Süddeutsche Konferenz included practically all the congregations in the Palatinate and Hesse and in the Verband, although this conference was not quite the same in character as the other two. Most of the congregations of the Palatinate and Hesse were members also of a local conference called the Pfälzisch-Hessische Konferenz. The refugee congregations of the former Danzig-West Prussia area were represented in a ministerial committee called "Aeltestenausschuss der Konferenz der west- und ostpreussischen Mennonitengemeinden." A committee for cooperation in North Germany (Gemeinden-Ausschuss in Nord-deutschland) was formed to help the nine old North German congregations and the nine new North German refugee congregations to work together. A "Mennonitischer Zentral-Ausschuss" served as liaison between the German conferences and the Mennonite Central Committee (MCC) of North America, which conducted relief work in Germany after 1946 and in 1956 had permanent German and European headquarters in Frankfurt (Eysseneckstrasse 54). Four other organizations formed which represented or served all Mennonites in Germany regardless of conference affiliation: (1) Mennonitischer Geschichtsverein, (2) Mennonitisches Altersheim, (3) Mennonitische Siedlungshilfe, (4) Deutsches Mennonitisches Missionskommittee. The only German Mennonite church paper in 1956 was the Gemeindeblatt der Mennoniten, published since 1870 by the Verband. Der Mennonit (founded in 1948), though printed (at Karlsruhe) and edited in Germany, was published as an international European Mennonite journal by the Mennonite Central Committee (MCC). Full information about the German Mennonite congregations, organizations, and institutions was found in the yearbook, Mennonitischer Gemeinde-Kalender, published since 1892 by the South German Conference. The Mennonitische Geschichtsblätter, founded in 1936, was the organ of the Mennonite Historical Society (Mennonitischer Geschichtsverein). German Mennonite institutions included four old people's homes in Germany—Leutesdorf, Enkenbach, Pinneberg, and Burgweinting; two relief agencies, Mennonitisches Hilfswerk "Christenpflicht" founded in 1924, and Hilfswerk der Vereinigung der Deutschen Mennonitengemeinden founded in 1947. There was also a Genossenschaftliches Flüchtlingswerk to aid in resettlement of refugees in Germany. Only the Verband has a deaconess work. The Mennonite board of directors of the former Weierhof school (Verein für die Anstalt am Donnersberg) operated a student house (Schülerheim) connected with the public high school (Gymnasium) at Kirchheimbolanden near Weierhof. The Verband had a significant institution in the Bibelheim Thomashof, founded in 1920, a spiritual retreat center. At the time of the rise of Anabaptism (1525-1535) what is now called Germany was a collection of 256 autonomous political units within a loosely organized Empire, called the Holy Roman Empire. Although Switzerland, the Netherlands, and North Italy were technically within the empire, they were actually independent, and the Hapsburg dominions, including Bohemia, Moravia, Silesia, and Lusatia, were outside the orbit of Germany proper. The account of the Anabaptist movement in this article will therefore exclude all these territories. 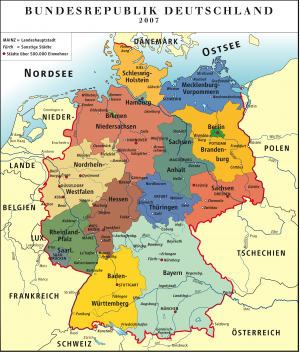 The area "Germany" in the 16th century as it is used here had therefore much the same boundaries as modern Germany 1871-1914, although, not having a unified government, it was broken up into many separate governments with varying religious policies. The soil in Germany had gradually become rather well prepared for a new religious movement. Already in the late Middle Ages sectarian tendencies had entered Germany (Waldenses, 1211-1480; Brethren of the Common Life since 1401; etc.). Erasmus and Luther, each in his way, were outstanding advocates of church reform. In the early twenties of the 16th century Karlstadt, Müntzer, and the Zwickau Prophets (Storch, etc.) each propagated a reform of his own, which were often wrongly called Anabaptist. Yet it was not the criticism of infant baptism which was decisive, but the introduction of adult baptism. So Anabaptism proper, arising out of Zwingli's reform, was part of the original Reformation movement. Anabaptism entered Germany first from the South (Switzerland), where it began in Zürich in January 1525. Wilhelm Reublin, appearing in Waldshut from Zürich in April 1525, baptized Dr. Balthasar Hubmaier, the pastor of the Lutheran Church there, and they together baptized most of the congregation, some 360 persons in all. In July Hubmaier published his Von dem Christlichen Tauff der Gläubigen. Other pamphlets by him followed. But in December of that year the Austrians conquered the city and forced Hubmaier to flee, practically ending the Anabaptist congregation. Hubmaier went to Augsburg next, where early in 1526 he established an Anabaptist congregation which became very large and influential, but he went on to Moravia, leaving Augsburg in the hands of Hans Denck, whom he had baptized in May 1526. Augsburg and Strasbourg now displaced Zürich and Switzerland as the centers of the growing Anabaptist movement, remaining so for some years. Michael Sattler, a noble man of God, became the chief leader in this area of southwest Germany until his execution at Rottenburg in May 1527. He was no doubt the leader of the Schleitheim conference, the first Anabaptist conference, of February 1527, and the author of the notable confession which it produced, the Brüderliche Vereinigung. Hans Denck, who moved about in the area Augsburg-Basel-Strasbourg-Worms, was the leader of a somewhat more mystical-spiritualist wing, but died at Basel in November 1527. He was related in spirit to men like Johannes Bünderlin of Linz, a more radical spiritualist and only for a short time an Anabaptist (1527-1529), Entfelder, likewise only briefly in the movement, and Jakob Kautz of Worms. The Sattler and Denck groups remained separate at Strasbourg, and probably constituted two distinct bodies. Denck preferred the "Inner Word" to the "Outer Word," and taught Christ as a teacher to follow and imitate rather than as a redeemer whose atonement saves men. Jakob Kautz's Seven Theses of 7 June 1527 at Worms also carry this position. Sattler was a full Biblicist and a thorough evangelical. Meanwhile in 1526-1527 Hans Hut, (d. December 1527 in prison in Augsburg where he had been arrested in September) had become a most effective evangelist for the Anabaptist cause, winning many converts in Swabia, Franconia, Bavaria, Salzburg, and Tyrol. In Augsburg men of note became leaders of the Anabaptist congregation in 1527-1530, like Sigmund Salminger and the patrician Hans Langenmantel. A noted conference was held here 20 August 1527, often called the "Martyrs' Synod" because so many of the missioners sent out from there lost their lives as martyrs within the following years. Another early center of Anabaptism was found in Hesse, Thuringia, and Franconia, where Thomas Müntzer had had some influence in 1523-1525. Melchior Rinck was the first Anabaptist leader here in 1528-1531 (in prison 1531-1551, where he died) near Hersfeld and Sorga, where there was a congregation. Moravian Anabaptist (Hutterite) influences were strong here for a time, numerous missioners coming here from the base in Moravia, including the noted Peter Riedemann, who wrote his great Rechenschaft, in prison near Marburg (Wolkersdorf) in 1540-1541. Anabaptists were in considerable strength in Hesse as late as 1578, when Hans Kuchenbecker and his brethren drew up an elaborate confession of faith for the authorities (Mennonite Quarterly Review 24, 24-34). Their criticism of the poor quality of life in the state church contributed greatly through Bucer to the introduction of the ceremony of confirmation, which passed from here into other Lutheran and Reformed state churches. The next outstanding leader to arise was Pilgram Marpeck of Rattenberg on the Inn, converted an Anabaptist in 1528, living in Strasbourg 1528-1532, then chiefly in Ulm and Augsburg until his death at the latter place in 1556. He was the most notable doctrinal writer of the South German Anabaptists (see his Vermahnung of 1542 and Verantwortung of 1544, both against Caspar Schwenckfeld, and his Testamentserläuterung of much the same time). He was the leader of a strong group, as the recent discovery of some 42 letters by him (found in a Bern library) attests. As soon as the German authorities, both Catholic and Protestant, became aware of the rising Anabaptist movement, they used every means at their command to destroy it. The first Anabaptist mandates by the Hapsburg rulers appeared in 1527. The notorious edict of the Diet of Speyer, ordering the extermination of the Anabaptists throughout the Empire, was issued 22 April 1529. In explanation of the attitude of the authorities, the close connection between the territorial government and the local church, which was already true at that time, must not be overlooked. It might have been possible to reform the whole of any given territorial church, but only as a whole and only in so far as the authorities thought fit. Luther and Zwingli and their followers had to learn that, and only as far as they learned it did they succeed at least partly. Hubmaier and the Münster Anabapists tried to go the same way, but they failed. And neither a congregation of saints nor the baptism of adults could win public opinion; nonconformity and nonresistance, the refusal of oaths, nonpayment of war taxes, and refusal of public offices, sometimes a leaning toward the revolutionary peasants, sometimes the hope that the coming of the Turks would announce the coming of Christ, made them suspect. And the magistrates felt responsible for the spiritual as well as for the physical welfare of their subjects. The Anabaptists' high morality, courage, and unflinching fidelity to their convictions impressed many again and again, but these were not sufficient to change the attitude of the others in general. So the advice of the Lutheran and Reformed theologians guided by their own creed, and the decisions of the lawyers guided by their tradition, resulted in a persecution with all the cruelty of medieval law and punishment (e.g., to counterfeit a coin was punished by burning at the stake). Hege (Mennonitisches Lexikon III, 6 and 7) for the first 20 years (1525-1544) alone enumerates 110 mandates against the Anabaptists: 27 Swiss, 27 Austrian, 15 Bavarian and Swabian, 16 Franconian, Hessian, Saxon, and Thuringian, 6 Alsatian, 4 Palatine, after 1530 also 8 in the north, besides 7 of the Emperor and the Empire in general. But though the principle of persecution was more or less the same, everywhere the practice showed much variation. The number of mandates also illustrates the number of Anabaptists in the one and the other area. Apart from Reformed Switzerland, the keenest persecutors were the Catholic King Ferdinand I of Austria and the Catholic dukes of Bavaria. Among the Protestant princes the electors of Saxony, supported by their theologians, did not shrink from capital punishment (first case 1530 at Reinhardsbrunn in Thuringia), whereas the Landgrave of Hesse never had an Anabaptist executed and even in cases when Saxony was also concerned he prevailed upon the elector to be content with imprisonment for life (e.g., Fritz Erbe, 1532-1548 at the Wartburg near Eisenach and not far from Reinhardsbrunn). The Counts Palatine in 66 years (1544-1610) several times changed their creed (3 times Lutheran, 3 times Reformed), but the report of 350 killed in the one year 1529 in the Palatinate (at Alzey) is an error, though a smaller number were killed there indeed. The imperial cities followed different policies and were often influenced by the princes nearby. At Nürnberg, Franconia, as early as 26 March 1527, an Anabaptist (Wolfgang Vogel) was executed, at Schweinfurt in February 1529 another (Georg Braun). In the bishoprics of Bamberg and Würzburg half a dozen were executed in 1528, and in the margravure of Brandenburg (Ansbach-Bayreuth) also about half a dozen in the same year. The century from the middle of the 16th to the middle of the 17th records the decline of the Anabaptist movement; the persecution gradually reached its goal. From 1548 to 1650 there were (Hege) only 78 mandates (in sharp contrast to the 110 for only the 20 years 1525-1544), the centers being the same as before; e.g., 24 Austrian and 16 Swiss mandates. In 1592 the last execution occurred (Thoman Haan of Nikolsburg) in Bavaria, in 1618 the last executions (Jost Wilhelm and Christine Brünnerin) at Egg near Bregenz in Vorarlberg (Tyrol), also the last in the Holy Roman Empire. All three were connected with the Hutterites who up to 1620 sent many missionaries from Moravia to the West, as also many from the West at this time fled to Moravia. Strasbourg long remained a chief meeting place of the Anabaptists. Here important conferences were held in 1555 and 1557, in which the Northern (Menno Simons) doctrines of the Incarnation and of the ban were repudiated by the Southern brethren. The Strasbourg conference of 1568, attended by many ministers and elders from all over southern Germany, dealt chiefly with certain rules of discipline. In 1557 and 1571 there were disputations with the Lutheran and Calvinistic authorities respectively of the Palatinate, the former at Pfeddersheim near Worms, the other at Frankenthal. The protocol of the latter was printed in 1571. Among the 15 Anabaptist participants one came from Andernach in the north, two from Alsace in the south, half a dozen from the Palatinate, one from Heilbronn, and one from Salzburg; two others and two Hutterites served as observers, so to speak. The story of the Hutterites is a chapter of its own, not to be told here. The history of the Anabaptists in Thuringia came to its end in 1584 (Wappler, Täuferbewegung in Thüringen), that of the Palatinate in 1610 (Hege, Täufer in der Kurpfalz), that of Tyrol in 1626 (Loserth, Der Anabaptismus in Tyrol). By the time of the Thirty Years' War practically all the Anabaptists in South and Middle Germany had been converted, exiled, or executed. It is rather easy to tell the story of the Anabaptists in North Germany separately from that of those in South and Middle Germany, though of course there are connections, Strasbourg especially being the meeting point. In Northwest Germany much the same tendencies were found as in the South. As early as 1522 Dr. Gerhard Westerburg, a patrician of Cologne, was visited by Nicholas Storch, who influenced him against infant baptism. A little later he came in contact with Karlstadt, whose sister he married and whose pamphlets and ideas he propagated. In the autumn of 1524 he even paid Zürich a short visit. But in general the question of baptism became important later in the North than in the South. The first martyrs of the Reformation were Adolf Clarenbach and Peter Fliesteden, both subjects of Jülich-Berg, but executed at Cologne in 1529; at least Fliesteden had a moderate touch of Anabaptism. About the same time (1530) Melchior Hoffman (1495-1543) brought to this area from Strasbourg the idea of Anabaptism and of a special doctrine of the Incarnation initiating Anabaptism here and founding a congregation at Emden, and soon reaching the Netherlands also. The "Aemter" and "Unterherrschaften" into which the duchies of Jülich, Cleves, and Berg were divided allowed the nobility a rather independent position. So the Aemter of Born, Millen, Heinsberg, Wassenberg, and Brüggen in the northwest corner of the duchy of Jülich adjoining the present Dutch province of Limburg along the Maas from Venlo to Sittard became a center of the Anabaptist movement. In 1529-1532 especially the court of the high bailiff (Drost) Werner von Pallant at Wassenberg was a meeting place for several clergymen, most of them from the bishopric of Liege (Campanus, Slachtscaep) and the duchy of Brabant (Roll, Vinne), also from Westphalia (Klopreis), known as the "Wassenberger Prädikanten." Klopreis (d. 1535) had been in touch with Clarenbach; from the common prison at Cologne he was rescued and brought to Wassenberg as the first of this group. Here again the influence of Erasmus was found together with that of Luther and Zwingli, and also spiritualistic tendencies and the rejection of infant baptism. With the exception of Campanus (d. after 1574), the leader, they went from Wassenberg to Münster in 1532-1534, were baptized there, and then were sent as apostles of the kingdom of the saints to Westphalia (Slachtscaep, d. 1534, and Vinne, d. 1534) and to the Rhineland (Klopreis and Roll, d. 1534), all ending as martyrs to their belief. After the first congregation at Emden (1530), the Lower Rhine-Maas congregation at Maastricht (1530-1535), Cologne (1531), Aachen (1533), and Emmerich (1534) must be recorded. The first martyr of this region who is mentioned in van Braght's Martyrs Mirror is Vit to Pilgrams at München-Gladbach (not 1532, as is said there, but 1537). At Münster (Westphalia) at first a local movement for religious and social reform was started by the Lutheran pastor Bernhard Rothmann and the merchant Bernhard Knipperdolling. Roll as the first of the Wassenberger preachers had already introduced their vision in 1532. Then, after Melchior Hoffman was imprisoned (for life, as it turned out) at Strasbourg in 1533, the Dutch Anabaptists took the lead. As Hoffman had thought of himself as Elijah and Strasbourg as the New Jerusalem and of the millennium immediately following his imprisonment, now the baker Jan Matthijsz van Haarlem declared himself to be Enoch, and Münster the New Jerusalem. The Anabaptist movement here became militant, and at the same time baptism became a political rather than a religious symbol. In February 1534 Matthijsz himself arrived at Münster (which now was besieged by the Catholic and Protestant princes of this region), and was killed in action at Easter (April 5) 1534. But one of his disciples, Jan Beukelszoon of Leiden, a tailor, full of eloquence and courage, under war conditions set up a dictatorship as King David of Zion. Discipline was enforced, communism and polygamy introduced, help asked from abroad. The fact that "banners were to fly in Friesland and Holland, Limburg and Jülich," shows what districts were expected to support the enterprise. But through famine and treason the city fell on 25 June 1535. Münster became Catholic again and many executions followed; Beukelszoon and Knipperdolling died not before 22 January 1536. The Münster catastrophe once more strengthened the hostile attitude of public opinion and of the authorities against Anabaptism of all kinds. It was Menno Simons (1496-1561) in Holland and North Germany who after the debacle gathered the nonresistant Anabaptists (for him they were named Mennonites after 1544). Soon he had to leave the Netherlands and found a refuge in East Friesland, where in January 1544 he had a disputation with John á Lasco, the reformer of the district. Then he had to leave East Friesland and went to the Lower Rhine-Maas area, where the endeavors to introduce the Reformation had not yet come to an end. Menno stayed and worked "in the diocese of Cologne" in 1544-1546. In vain he strove for a disputation with the "scholars" at Bonn (electorate of Cologne) and at Wesel (duchy of Cleves). But about 1545 he lived with Lemken (see below) at Illikhoven (one part belonging to the Amt Born, duchy of Jülich, another part belonging to Roosteren in the duchy of Geldern) and Vissersweert on the Maas (Amt Born), now both in the Dutch province of Limburg. He preached in the environs of both places and also reached Roermond and may have founded the Anabaptist congregation of Illikhoven-Vissersweert. At any rate after the Wassenberg preachers and their adherents had left for Münster, and Menno had visited the region, organized congregations remained or were founded anew. Roelof Martens, usually called Adam Pastor, had been ordained as elder by Menno (in 1542?) and excommunicated by Dirk Philips and Menno in 1547. Nevertheless he continued his work in his district from Overijssel in the Netherlands to the county of Mark (Hamm) in Westphalia, having his seat at Odenkirchen (exclave of the electorate of Cologne), and at Well on the Maas (duchy of Geldern), here and there under the protection of a member of the van Vlodrop family. Menno and Adam diverged from the orthodox Christology in opposite directions. In Jesus Christ Menno, following Melchior Hoffman and Obbe Philips (d. 1568), overstated the divine nature, and Adam the human one. The idea of a pure congregation called for a divine head of the church; the idea of an imitation of Christ called for a human head. Matthias Servaes, ordained by Zillis (see below), and Heinrich von Knifft worked especially in the area of München-Gladbach; Matthias Servaes worked also at Cologne, where he was executed in 1565. More to the South, in the Aemter Born, Millen, etc., of the duchy of Jülich the records showed an office of teaching and baptizing and of deacons for the poor. About 1550 an elder Leitgen died, and in 1550 the "principal teacher" Remken Ramakers was executed at Sittard, Amt Born. They were succeeded by Theunis van Hastenrath, who had his seat at Illikhoven and worked from the Maas to the Rhine (from Kleve to Essen and from Maastricht to Bonn), being executed at Linnich on the Roer in 1551. He was succeeded as elder by Lemken, formerly deacon at Vissersweert in 1547 and at Illikhoven in 1550, working at first in the western Aemter of the duchy of Jülich and along the Maas, later also in a wider area. Farther to the South, in the Amt Montjoie in the Eifel Mountains, Zillis, another elder, was found who together with Lemken (and the Dutch Waterlanders and the South German Anabaptists) fought the rigid attitude of Menno concerning excommunication and shunning from 1557 to 1560, when Menno excommunicated Lemken and Zillis as well as the Waterlanders. Thus Menno and his friends on the one side, and the Waterlanders, the "High Germans" (Lemken and Zillis in Jülich), and the Southern Anabaptists on the other side, were separated. Zillis worked in the duchy of Berg on the right side of the Rhine as well as in the duchy of Jülich on the left side. There were martyrs, e.g., Palmken Palmen (1550) at Born, Maria of Montjoie (1552) at Jülich, and Conrad Koch (1565) at Honnef in the duchy of Berg. Thomas von Imbroich from Imgenbroich near Montjoie was executed at Cologne in 1558. Some Hutterite missionaries were executed in 1558-1559 at Aachen. In spite of such sacrifices (or because of them) the congregations on the Lower Rhine in general held their own to the end of the 16th century and into the 17th, not being exterminated as was the case in Middle Germany and to a large extent in South Germany. In May 1591 a decisive meeting took place at Cologne under the guidance of Leenaert Clock. Congregations of the Upper Rhine, Breisgau, Alsace (Strasbourg, Weissenburg), and the Palatinate (Kreuznach, Landau, Landesheim, Neustadt, Worms) were represented. Of the Lower Rhine the congregations of the city of Cologne, of the electorate of Cologne (Odenkirchen), of the duchy of Cleves (Rees), of the duchy of Jülich (area of Milien and Maas, München-Gladbach), and of the duchy of Berg were represented. Practical questions prevailed, but some doctrinal questions appear in the first part of the Concept of Cologne. If on the one side the Trinity was confessed, on the other side the Holy Spirit was described as a power of God (and so not as the third person of the Trinity). He who was baptized according to Anabaptist order was not to be rebaptized. The 17th century put these congregations under new conditions. Anabaptists were in general expelled in 1601 from the cities of Aachen and Cologne, in 1614 from Burtscheid (then belonging to the Imperial Abbey of Cornelismünster, now incorporated into Aachen), and in 1628 from Odenkirchen. In 1614 the united duchies were divided into tolerant Cleves under the Hohenzollerns and intolerant Jülich-Berg under the Wittelsbachs. From 1600 on the county of Mors with the dominion of Krefeld for a century belonged to the tolerant House of Orange. Thus, early in the 17th century a congregation was founded at Krefeld, which now became the place of refuge for Mennonites on the Lower Rhine, as well as some congregations in the duchy of Cleves (Goch, Kleve, Emmerich, Rees, Duisburg). It is worthy of note that the founder of the congregation of Krefeld, Hermann op den Graeff (1585-1642), together with a second representative, Wilhelm Kreynen, signed the Confession of Dordrecht in 1632. East Friesland remained a place of refuge for the Anabaptists, first in the country, especially near Krummhorn. Later there were three congregations of importance besides Emden: Norden, Leer, and Neustadt-Gödens. In 1612 there were a total of about 400 Anabaptists in East Friesland. There were also some across the eastern border in the county of Oldenburg. Among the first grants of toleration for Mennonites is that given by Count Rudolf Christian in 1626 for his country. Emden reached the climax of its history in the 16th century. Situated next to the Netherlands, but maintaining its independence, it was again and again (like Wesel in a similar situation) used as a starting point by the Anabaptists for influencing the Netherlands from the outside. In 1568 and 1579 meetings of the Waterlanders were held at Emden. In 1571 a Reformed synod took place there. In 1578 there was a religious disputation between the Flemish Anabaptists and the Reformed, of which the Protocol was published in 1578; from Cologne and Groningen Anabaptist elders were present. For years Leenaert Bouwens had his headquarters at 't Falder near Emden, and baptized 320 persons here alone, in other places of East Friesland also 323, but during 1551-1582 many more in the Netherlands and a few also in Cologne, Holstein, and Mecklenburg. It is also probable that many refugees from here found their way eastward—a few, as said before, to the adjacent Oldenburg, but practically none to the district between the Weser and the Elbe (the archbishopric of Bremen). The two duchies of Schleswig and Holstein, the dominion of Pinneberg, and the two imperial cities and Hanseatic towns of Hamburg and Lübeck were the goal for many. The first place in this area where Anabaptists were to be found was Lübeck. Here in 1535 the burgomaster Jürgen Wullenweber (d. 1537) took a friendly attitude toward the Anabaptists. As early as 1532 Cord Roosen (1495-1553 or 1554) of Korschenbroich near Grevenbroich (near München-Gladbach), had found his way to Lübeck. His sons and a grandson were, surprisingly, powder manufacturers. In 1546 Menno Simons held a meeting here concerning David Joris (d. 1556), and in 1552 concerning Adam Pastor. In the winter of 1553-54 Menno was living at neighboring Wismar in Mecklenburg, where he debated with the Reformed preacher Micronius (d. 1559). Here the Wismar articles were adopted in 1554. Later Menno, with the Anabaptist printing plant recently founded at Lübeck, went to Fresenburg near Oldesloe between Lübeck and Hamburg. Here arose the first congregation (Flemish) in this area; and here Menno found an abode undisturbed by the authorities for his last years (1554-1561). In the second half of the 16th century the Anabaptist impact more and more shifted from the eastern to the western part of this area. During the same time here and often elsewhere it also changed its character more and more: Anabaptists were becoming Mennonites. The struggle for a new vision was disappearing, though the loyalty to convictions remained. While Baptists and Quakers soon undertook to propagate the one or other of these convictions, the Mennonites were content to have permission to live according to their convictions, and in addition to be good manufacturers or farmers and citizens. This development may be the consequence of a colonial existence, of a flight into another country, where first a living had to be made. On the west coast of Schleswig-Holstein the first Mennonites (as we now may call them) appeared sometime before 1566 when five of them had already been exiled, on the peninsula of Eiderstedt in the duchy of Schleswig, not far from the border of the duchy of Holstein, belonging to the Gottorp portion. Soon there were wholesale merchants, among them Johann Clausen Codt (also Kotte, Cotte, Cothe, Coodt), a dike-reeve who, like Marpeck, early in the 17th century sustained the religious wishes of his fellow believers by protecting the land and so being very helpful to the country. In 1621, when Duke Friedrich III of Holstein-Gottorp (1616-1659) founded Friedrichstadt east of Eiderstedt as a Dutch place of refuge, he gave the Mennonites very liberal privileges. Some years earlier already (1616) the king of Denmark, who with the Gottorps and (until 1640) the counts of Schauenburg (dominion of Pinneberg) shared the whole country, had founded Glückstadt on the Elbe, south of Friedrichstadt, as a place of refuge; here from 1623 on Mennonites were accepted as citizens and from 1631 on were mentioned in a grant of toleration for "the Dutch nation" in the city. But the greatest importance for the Mennonites in this area was gained by Hamburg, the imperial city, and the adjacent Altona, first a village of fishermen, since 1604 a borough in the county of Pinneberg under the Schauenburgs, after 1640 under the kings of Denmark, after 1664 a town under municipal law. By 1575 Mennonite families were found at Hamburg (de Voss, Quins, etc., coming from the Netherlands), and 1601 at Altona (Francois Noe II, whose father had come from Antwerp to Hamburg, originally from Flanders). At Hamburg the Mennonites made a contract with the city in 1605 (renewed in 1635). Noë as a wholesale dealer had come in touch with Ernst, Count of Schauenburg, and was allowed with others to settle on the "Freiheit" next to Hamburg. He obtained a "privilege" for his coreligionists in 1601 (renewed in 1635 and again in 1641). Though living in different states (until 1937, when Altona was incorporated into Hamburg), the Mennonites of the two places had no separate congregations. A still larger colonization enterprise of Dutch Mennonite refugees were the settlements in Prussia proper, the German melting pot. In Ducal (or East) Prussia the Duke, himself excommunicated by the Pope and outlawed by the Emperor, even had councilors with an Anabaptist past, from 1536 Christian Entfelder, the pupil of Denck, from 1542 Gerhard Westerburg, the pupil of Storch and Karlstadt, baptized at Münster in 1534. Immigrants were Schwenckfelders (since 1527), Dutch Sacramentists (since 1527), Gabrielites (1535), Bohemian Brethren (1548), and from ca. 1535 Dutch Anabaptists, who settled especially at Königsberg and in the district of Preussisch Holland near the border of Royal (or Polish or West) Prussia. After the church inspection (the duke was now following a Lutheran course) in 1543 they were exiled; only a few remained. As the devastation in consequence of the "Reiterkrieg" (1519-1525) opened the door for immigrants into East Prussia, so the floods of the Vistula (1540-1543) did the same in West Prussia; here the immigrants were expected to drain the inundated land. The first contract was made in 1547 for the Danzig Werder or delta (Reichenberg, etc.) by Philip Fresen of Edzema, another in 1562 for the Great Marienburg (Unter) Werder by the Loysen brothers at Tiegenhof. In the same period Mennonite settlers reached the cities of Danzig and Elbing as well as the lowland to the left and the right of the Nogat (Ellerwald, Little Marienburg Werder) and somewhat later also the pastures of the Great Marienburg (Ober) Werder at Heubuden. Rather early there were Mennonites also along the Vistula up to Thorn. Menno visited "the elect and children of God in Prussia" in the summer of 1549 and wrote them a letter in the autumn of that year. Later Dirk Philips (d. 1568), its founder, was at the head of the Danzig congregation. A successor of his, Quirin Vermeulen (also "van der Meulen"), in 1598 published a stately edition of the Bible in Dutch translation (the Biestkens Bible). In 1608 at the diet at Graudenz, the Bishop of Culm, Poland, Laurentius Gumbicki, made a statement to the effect that the Marienburger Werder was filled with Anabaptists. Yet it is reported that at least 80 per cent of the Mennonite farmers had perished of marsh fever in connection with the work of draining and clearing the land. In 1642 King Ladislav IV of Poland (1632-1648) gave the Mennonites a grant of privileges in which he declared that King Sigismund Augustus (1546-1572) had summoned the Mennonites into a district "which then was a desolate swamp and not used. With great effort and large expenditure they had made this district fertile and profitable by turning woodland into arable land and establishing pumps in order to remove the water from the inundated grounds covered with mud and to erect dikes against the floods of the Vistula." We have already observed that from the second half of the 16th century the Anabaptist type more and more died out in Germany and was replaced by the Mennonite type. As evangelization and with it conversion and martyrdom disappeared, with later generations rebaptizing disappeared also, occurring only here and there within the Mennonite groups and being plainly replaced by adult baptism of the following generation when grown up. Thus the imperial mandate of 1529, so to speak, lost its objective; in 1768, for instance, the Imperial Court at Wetzlar even recommended that the affirmation of a Mennonite might be regarded the same as the oath of another. Thus the original endeavor to better the Christian testimony to the world, so much resented by this world, was toned down into the desire of a small religious group to be allowed to live for itself, yes, according to its tradition. And this nonconformity to the world was precisely what made these believers the best farmers, artisans, manufacturers, etc., now highly esteemed by the rulers in this period. So wanderings continued from territories where the Mennonites were persecuted as heretics to other territories where they were welcomed as good citizens. The interest of the world turned more and more from religious problems to economic ones, the Thirty Years' War being the boundary between the older and the newer attitudes. Going from southwest to northeast, there are the migrations of the Swiss Brethren to the Palatinate, where after the devastations of the Thirty Years' War Elector Karl Ludwig (1617-80) gave them a Privilegium in 1664. As early as 1652 they are found near Sinsheim (east of the Rhine, Kraichgau, now Baden-Württemberg) and soon afterwards on the Ibersheimer Hof (west of the Rhine, now Rheinland-Pfalz). The nobility of the Kraichgau between Heidelberg and Karlsruhe opened their domains to the Swiss refugees, as did also Alsace and at least from the beginning of the 18th century also the margraves of Baden-Durlach. For many of the Swiss emigrants the new home was of rather short duration because of the war of the Palatine Succession (1688-1697). The French invaded and devastated the territory once more, and notwithstanding the Privilegium oppressions were frequendy applied. So from 1707 on many of them searched and found a more lasting place of refuge in Pennsylvania. But many also remained in Germany, some in the Palatinate, some (mostly Amish) crossing the Rhine and the Main to the north and founding (ca. 1750 and later) settlements in Nassau and Hesse, in the county of Wittgenstein (now in Westphalia) and in the county of Waldeck (now in Hesse). Soon afterwards others (Mennonites) turned to the east, to the bishopric of Würzburg (now Bavaria) and the duchy of Württemberg. And when Emperor Joseph II, after gaining Polish Galicia in 1772, invited colonization there in 1781, since the new subjects needed instruction in agriculture, 28 families, most of them Palatines, some of them. Alsatian Mennonites and Amish, settled near Lemberg in 1784. Farther to the north as early as the 17th century the Mennonites of the duchy of Jülich (1654 from München-Gladbach, 1694 from Rheydt), often linen weavers, found their way to the place of refuge in this region, Krefeld. In addition the (great) Elector of Brandenburg in 1654 and 1660 issued mandates favorable to the Mennonites for his duchy of Cleves, quite contrary to the intolerant mandates of the Wittelsbachs in Jülich. Even in the county of Mark, now also inherited by the Hohenzollerns, a small congregation existed at Hamm (now in Westphalia). A center of its own was Neuwied (founded in 1652 on the Rhine as the new residence of the counts of Wied. Even from the very beginning immigrants of the northern group of Mennonites (Jülich, etc.) and of the southern group (Switzerland, Palatinate) met here. In 1680 they were given a Privilegium, and in 1768 the Count even helped them to get a church, opposite his castle and in the same rococo style of architecture. Then in the east there was the migration from West Prussia to East Prussia (from 1713 on to the area of Tilsit, and from 1716 on to Königsberg, the attitude of the kings changing, but the local authorities continuing to favor the Mennonites. Later on the Mennonites also moved to the southeast along the Vistula ca. 1750 into Poland proper (Deutsch-Wymysle, and Deutsch-Kazim, to the west in 1765 into the province of Brandenburg (Neumark). Most settlements in this period secured legal toleration by a grant called a "Privilegium" (concession). Some of these concessions were given by the following rulers: (1) Duke Friedrich III of Holstein-Gottorp, dated 13 February 1623, for Friedrichstadt in Schleswig; (2) Count Rudolph Christian of East Friesland, 26 May 1626, for his country; (3) King Christian IV of Denmark, 6 June 1641, for Altona in Holstein; (4) King Ladislav IV of Poland, 22 December 1642, for his country; (5) Elector Karl Ludwig of the Palatinate, 4 August 1664, for his possessions; (6) Count Friedrich of Wied, 16 December 1680, for Neuwied on the Middle Rhine; (7) King Friedrich Wilhelm I of Prussia, 30 January 1721, for Krefeld. These documents have been preserved in the original or in copies in various archives, most of them also in printed form, some in several editions. Sometimes older "privileges" were renewed or extended, and also here and there they underwent certain revisions. Sometimes they were limited to a single place (Friedrichstadt, Altona, Neuwied, Krefeld). Elector Karl Ludwig expressly mentioned the protracted war and its effects, and King Christian the importance of the immigrants for trade and commerce. Count Friedrich became the model for other princes of the Empire; he founded the town of Neuwied in the interests of his small territory specifically as a place of refuge for tolerated as well as "privileged" religious groups, hoping to secure as settlers at least part of those "useful" people who had to leave ruined homes elsewhere. The Mennonites were here allowed to conduct their own worship, though it had to be in secret and without making proselytes by "sweet words" (as it is stated in the Altona privilege), and were exempt from attending the worship of the established church, holding public office, bearing arms, and taking the oath. They were even protected against "mockery" (as it is stated in the Friedrichstadt privilege). For all this they only had to be recorded in special registers and to pay a special tax. The situation of the princes of the Empire in this time as well as their opinions and intentions were rather remarkably revealed by the Neuwied privilege of 1680. The count had asked the Mennonites to attend the official (Reformed) services, but they had asked him to release them from this obligation. So the count pondered and said in his privilege: He was entitled to enforce his requirements, for the imperial law of 1529 expressly forbade tolerating Mennonites in the Roman Empire, and the Peace of Münster of 1648 only permitted Roman Catholics, Lutherans, and Reformed, and even the Imperial Court when authorizing this new residence did not include the Mennonites. But on the other hand they were living quietly, the electors of Brandenburg and the Palatinate and the duke of Holstein and others occasionally tolerated them and so disregarded the law of 1529, and at least he was a free "Imperial Estate" as well, and so by tacit understanding empowered to do the same. And so he gave the privilege in the face of the imperial laws which had settled the problem otherwise. Not the Empire, but the individual territory possessed the real power. To understand the system of privileges within the territories it must be pointed out that in this period people did not live under equal rights for all, but that rights were differentiated according to the political, social, ecclesiastical, and economic position of the person in question. Thus at Krefeld, e.g., there was no difficulty in releasing the Mennonites from the oath, since the Reformed clergy were liberated from this obligation also, as is seen incidentally from a report concerning the oath of allegiance. Besides, such privileges gave the princes an opportunity to secure able artisans, etc., and in this time of mercantilism it was quite common for princes to attract such persons from one another. Just as arbitrarily as privileges were given, citizenship was also transferred: at Elbing as early as 1585, at Tönning in Eiderstedt in 1607, at Krefeld in 1678, at Königsberg and Marienburg ca. 1750, at Danzig and in Bavaria not before 1800. Though much scattered by the migrations, under these conditions the Mennonites of Germany reached the culminating point of their history in this period as far as economics were concerned. It may here be sufficient to name David Möllinger (1709-1786), "the father of the agriculture of the Palatinate," the. von der Leyens and the silk industry at Krefeld, the Roosens at Hamburg, and the van der Smissens at Altona, shipowners and whalers of the first rank; or also the gifted mechanic and clockmaker Peter Kinsing (1745-1816) at Neuwied, and the strong Bouman family with its manifold trade at Emden. A real host of Mennonite entrepreneurs at many places promoted the economic advance of their respective areas; kingly merchants they often were, especially in the Lower Rhine district and on the Lower Elbe. As to the spiritual life, the northern settlements (Holstein, etc., and Prussia proper) in the beginning were dependent on the Netherlands, and the southern (Palatinate and its daughter colonies) on Switzerland. The Lower Rhine and East Friesland in their turn were already geographically as neighbors in constant contact with the Netherlands. Visits and exchange of preachers for a long time helped in this direction. When in the north, e.g., Gerhard Wiebe (Flemish elder of Elbing 1778-1796) had documents copied (Heubudener Urkundenbuch) which he regarded of particular importance also for his congregation and his time, there were among these documents some relating to the division of 1557 (Menno against the Waterlander, Jülich, and South German-Swiss leaders), that of 1567 (Flemish against Frisian), and that of 1586 (Contra-Housebuyers against Housebuyers). In the case of Quirin Vermeulen and Hans von Schwinderen, elder and preacher of Danzig (1583-1588), and for a later controversy at Haarlem in 1631, the documents showed a vivid interchange of opinions and judgments. So even in 1759 the Dutch divisions were still maintained in East Friesland, in the Holstein region, and in Prussia proper. Old Flemish of the Groningen branch had congregations at Emden, Leer, Neustadt-Goedens, and Norden in East Friesland, and at Przechowka, etc., near Schwetz in Prussia proper. Those of the Danzig Old Flemish branch appear at Danzig, Elbing, Gross-Werder, Heubuden, Königsberg, and Nieschewski near Thorn, all in Prussia proper. The Flemish (alone or combined with Frisians and Waterlanders) had congregations at Emden, Leer, and Norden in East Friesland, at Friedrichstadt and Hamburg-Altona in the Holstein region. Finally the Frisians or Waterlanders (the names change) were represented at Danzig, the Gross Werder (later Orlofferfelde), Lithuania (the Tilsit region), Montau, and Schweinsgrube (later Tragheimerweide) in Prussia proper. At Emden and Hamburg-Altona the congregations had joined the conservative Zonists in 1674 and 1682 respectively. But at Emden and Leer in 1767, at Norden in 1780, and at Danzig in 1808, the congregations were again united. In 1739 and following years a discipline controversy about wigs, shoe buckles, etc., at Danzig was settled after the Dutch brethren had been asked for their judgment. In 1776 at Hamburg a German translation of the Ris confession of faith (1766 at Hoorn) was published, which remained in use in German congregations until the 19th century. But soon an independent spirit announced itself among the German Mennonites alongside of the dependency on Dutch developments, especially in literary productions by the settlements on the Elbe and on the Vistula. In 1660 the first German confession of faith appeared at Danzig. Georg Hansen (d. 1703), a shoemaker, from 1655 deacon and preacher and 1690-1703 elder of the Flemish congregation at Danzig, published a catechism in 1671 and a confession of faith in 1678. Gerrit Roosen (1612-1711), a merchant, from 1649 deacon, from 1660 preacher, from 1663 elder of the Flemish congregation of Hamburg-Altona, in 1702 also published a catechism (Christliches Gemütsgespräch) and an apologetic (Unschuld und Gegenbericht). Heinrich Donner (1735-1804), Frisian elder of Orlofferfelde since 1772, and Gerhard Wiebe in 1778 and 1783 published a catechism, which as the Elbing-Waldeck-Zweibriicken catechism was one of the most widely used in Europe and in America. In 1792 Gerhard Wiebe also published a confession of faith. A new influence from the Netherlands began withe the introduction of trained and salaried ministers, e.g., at Krefeld since 1770, who received their education more and more at the Amsterdam Mennonite Seminary, established in 1735. In the South the Palatinate Mennonites also showed a continued dependence on Switzerland. Peter Ramseyer (b. 1706), from 1730 preacher and from 1732 elder of the Jura congregation, for 20 years (1762-1782) again and again traveled to the Palatinate to settle dissension there. The Amish division of 1693 especially affected the settlers in the Palatinate. Amish congregations arose by migration from the Netherlands to Volhynia; the most northern points they reached in Germany were Menge-ringhausen in Waldeck, and Petershagen in Minden west of Hanover. The Amish remained in strong contact with each other, at least from Alsace to Waldeck, at meetings where "Ordnungsbriefe" supplemented earlier decisions on discipline. Hans Nafziger, from 1731 preacher and later elder at Essingen in the Palatinate, a central figure in his time, held such meetings at his place in 1759 and 1779. In 1765 he traveled to the Netherlands to settle dissension among the Amish there. In 1780 he published the only edition of theMartyrs' Mirror in German in Germany at Pirmasens, together with Peter Weber. In 1781 he wrote a letter to the Amish in Holland as a kind of formulary for baptism, marriage, and ordinations. As religious discrimination from 1650 on gradually lost much of its former intensity, the Mennonites could come into contact with religious movements outside their group. In fact, the Mennonite congregations not seldom proved themselves to be a fertile ground for such movements. Among the outside influences were (1) Quakers, (2) Dompelaars, and (3) Pietists. The Quakers appeared at Kriegsheim in the Palatinate soon after the Mennonites, gained some of them for their convictions, and had a congregation of their own there 1657-1686, when they immigrated to Pennsylvania. They also appeared at Hamburg-Altona in 1659, but not being allowed to stay there soon left again, taking with them some Mennonites, among tliem the preacher Berend Roelofs. They were at Krefeld also in 1667-1683. In the latter year they induced 13 families (formerly Mennonites) to emigrate to Pennsylvania, where they founded Germantown —only one remained Mennonite in the long run; it was the first group of Germans to reach the later United States of America. The Dompelaars were found at Hamburg-Altona in 1648-1746, having their own congregation alongside the Mennonite congregation from ca. 1656 on, their own church building from 1708. Their most prominent preacher was Jacob Denner ( 1659-1746), from 1684, at Lübeck 1687-1694, at Friedrichstadt 1694-1698, at Danzig 1698-1702, and then again at Altona until his death. He preached for an interdenominational audience. Perhaps the group was influenced by the Dutch Collegiants or by the English Baptists. The Dompelaars found at Krefeld in 1705-1725 were of another kind, viz., Dunkers, who in 1719 also turned to Pennsylvania. In the Mennonite congregation at Krefeld for some time one preacher, Gossen Goyen (1667-1737), advocated baptism by immersion, himself being rebaptized in 1724 in the Rhine, and another, Jan Crous (1670-1729), advocated baptism by sprinkling. The Pietists exercised an especially long and far-reaching influence upon the German Mennonites. It came both from the outside and also through Mennonite channels. In Holland the outstanding Mennonite Pietist was Jan Deknatel (1698-1759), from 1726 the minister of the congregation 't Lam at Amsterdam, converted (in the Pietist sense) in 1734 and standing in close relations with the Moravians and the Methodists. On the Lower Rhine Gerhard Tersteegen (1697-1769), Reformed, from 1725 an interdenominational spiritual adviser, gained a similar position. In 1735-1769 Tersteegen was in close contact with the Krefeld Mennonites and later also with Lorenz Friedenreich (ca. 1728-1794), from 1758 elder of the Mennonite congregation at Neuwied. Friedenreich, in this time of letter writing and traveling and exchange of books and pamphlets, served as a liaison officer in all directions. In his last years Deknatel became instrumental in the conversion of Peter Weber (1731-1781), a weaver and from 1757-1758 until his death preacher of the Mennonite congregation of Höningen near Altleiningen in the Palatinate. Abraham Krehbiel (d. 1804), farmer and preacher (from 1766) of the Mennonite congregation at the Weierhof, was also from his ordination on in contact with Weber, Tersteegen, and Deknatel's son. It was as in a missionary family, and thus also the namelists (Naamlijst), which at Deknatel's instigation were published at Amsterdam from 1731 on, and the endeavor to make them complete, widened the circle more and more. Under the pietist influence even a correspondence between Prussia proper and the Palatinate, so far distant from one another, was started (1768-1773). Hans van Steen (1705-81), elder of the Flemish congregation at Danzig from 1754, and Martin Möllinger (1698-1774), brother of David Möllinger, preacher of the congregation at Mannheim from 1753, were the principal writers. Some letters also came from Gerhard Wiebe (see above) and Frienenreich, Weber, etc. Pietists in West Prussia were Isaak van Diihren (1725-1800), converted in 1772, from 1775 preacher of the Danzig Frisian congregation, who in 1787 published a German extract from the Martyrs Mirror, and Cornelius Regier (1743-1794), from 1764 preacher, 1771 elder of the Heubuden congregation. On the Elbe a stronghold of Pietism was the van der Smissen family, particularly Gysbert III (1717-1793) and his son Jacob Gysbert (1746-1829), who already in 1766-1768 on his cavalier's tour with his cousin Hinrich III (1742-1814) visited in England the great evangelist and cofounder of Methodism George Whitefield, and in Germany Tersteegen and the Moravian settlements, Herrnhut and Niesky. At his advice this cousin in 1781 engaged as a tutor for his many children Johann Wilhelm Mannhardt (1760-1831), a member of the Tübingen Stift, who in 1790 married one of his pupils, thus combining these two families, which were prominent among the German Mennonites, especially in the 19th century. In addition to these relations with more or less kindred movements the Christian church in general, and the great world also, entered the scene. Gerrit Roosen had already taken a position as a conservative as well as irenical trying to recommend the controversial Mennonite teaching to society as "harmless": Mennonitism in assimilation. At Friedrichstadt two Owens, father and son, were during 1711-1782 successively one of the two burgomasters of the town: public offices were no longer abhorred. In London in 1766 the young van der Smissens enjoyed seeing English soldiers at drill; at Neuwied the young men of the Mennonite congregation in 1804 wanted to meet their new prince on horseback, with swords buckled on, like other young citizens: the principle of nonresistance was at least softened. And even Gerhard Wiebe in his confession of faith of 1792 dropped the idea of a visible congregation of saints and accepted that of an invisible church. Whereas at Danzig in 1697 the painter Enoch Seemann (b. 1661) was banned for painting portraits (Second Commandment), at Hamburg-Altona Balthasar Denner (1685-1749) and Dominicus van der Smissen (1705-1760), the son and son-in-law of Jacob Denner, were "the last German portraitists of international importance." After the Swedish General Stenbock had burned the town of Altona in 1713, Hinrich I van der Smissen (1662-1737, father of Gysbert III) rebuilt it, thus becoming known as "the city builder." Berend Roosen discovered the famous architect Sonnin and had him build his home, one of the finest in Hamburg in the 18th century. Later the great Mennonite manufacturers gave Krefeld its architectural character by their monumental homes, one of their homes even being called "the castle" (later the town hall). In 1687 and 1688 the Danzig congregation helped the Jesuits and the Lutherans respectively to build their churches; in 1750-1751 the Hamburg-Altona congregation helped to rebuild the Lutheran St. Michael's Church; in 1779 the Emden congregation shared in the costs of a Reformed peace festival. In 1732 the Danzig Mennonites made a contribution for the Salzburg exiles; for decades the Friedrichstadt Mennonites had done the same for the poor Lutherans of their town. In Krefeld the van der Leyens in 1738 had Roman Catholic, Lutherans, and Reformed among their laborers and in 1789 promoted social contacts between members of different denominations. In this course of events it is not astonishing to see also the Mennonite church buildings and services adapted to the surrounding culture. Many of the new church buildings—in 1751 Orlofferfelde, 1754 Rosenort, 1768 Fürstenwerder, Heubuden, Ladekopp, and Tiegenhagen, 1776 Gruppe, 1783 Ellerwald (all in West Prussia), 1778 Sembach, 1779 Eppstein, 1784 Heppenheim (all in the Palatinate); also the old churches—1586 Montau, 1618 Schönsee, 1638 and 1648 Danzig, 1675 and 1715 Altona, 1693 Krefeld, 1769 Emden—indeed were modest buildings. But Elbing (1590) and Friedrichstadt (1708) were fine patrician buildings, and Norden (1796) was even a finer one in a splendid rococo style. The Spitalhof (1682) held its services in a beautiful old Gothic chapel. The church of Neuwied (1768) has already been mentioned. Organs were first admitted to German Mennonite churches at Altona (1764) and at Norden (1797). Language was long a great barrier between the immigrant German Mennonites and the native Protestants or Catholics. This was not so true in the South, where the Swiss dialect was apparently soon given up and the High German literary idiom commonly used from the start, but in the North things were more complicated. The Mennonites from Holland of course brought the Dutch church language of their old home with them into the new one. The congregations on the Dutch-German border so close to the Netherlands, which was enjoying its political and cultural Golden Age in the 17th century, naturally also felt the Dutch influence in the matter of language. Yet naturally in the course of time the Dutch language for church services, in partly alien, partly changed surroundings, with no support from the language in general use, declined and was pushed aside. It is easy to understand that this development took place most rapidly at the most advanced Anabaptist-Mennonite outpost, in West Prussia around Danzig. By 1671 Georg Hansen lamented that the young people read German better than Dutch. So in the rural congregations at Heubuden in West Prussia in the 1750's and the city congregation at Danzig in the 1760s and 1770s the ministers began to preach their sermons in German. Farther to the west the proximity of the Netherlands was of strong influence; also the fact that the educated ministers called by these congregations had to be obtained from the Netherlands or had to get their training in the Dutch universities and especially in the Mennonite Seminary at Amsterdam. In 1786 at Hamburg and Altona Reinhard Rahusen (1735-93) first began the use of High German in the newly introduced weekday services; in general the High German language was not used here in sermons until 1839 and in the church records not until the 1880s. Krefeld used German after 1818, Friedrichstadt after 1826. For the history of the Mennonites in Germany a turning point came when the French Revolution did away with local independence and local privileges, in 1789 proclaiming "Liberty, Equality, Fraternity" as the rights of all men, and in 1793 introducing universal compulsory service. Napoleon moderated this law in 1800 by allowing substitutes under special conditions, but enforced it anew in 1806. Since the treaties of Basel (1795) and of Campo Formio (1797), the Rheinbund (1806), and the treaty of Tilsit (1807) ceded the left border of the Rhine to France and placed practically all Germany west of the Elbe under the control of Napoleon I, similar decrees followed, especially in the South German states. In the face of this danger to nonresistance the Mennonites of the Palatinate as early as 1802 sought contact with those of the Netherlands. In 1803 and 1805 at Ibersheim representatives of Rhenish congregations professed anew their adherence to the principles of nonconformity and nonresistance. Several delegates were sent to Paris on behalf of their privileges. In vain; no exceptions were allowed, only perhaps substitutes. But to obtain substitutes was rather expensive. Some congregations even regarded paying substitutes as contrary to nonresistance. For some time some of the congregations paid for the poor members who could not pay the substitutes. But later on this practice was discontinued, since nonconcerned members opposed it. So, on the one hand many immigrated to America in 1830-1860; on the other hand, as the conditions continued, those remaining in South Germany gradually gave up the principle of nonresistance. The catechisms of the Palatinate and Hesse (i.e., old Palatinate on the left border of the Rhine) of 1861, and of Baden (i.e., old Palatinate on the right border of the Rhine: the Kraichgau and Baden-Durlach) of 1865 had already tacitly dropped the principle. Early in the 20th century, when Georg Wünsch asked a young farmer in Baden why he did not follow the traditional order, this Mennonite answered, "When every man goes, we can't stay at home." In North Germany the kingdom of Prussia after the peace of Vienna in 1815 comprised the following Mennonite population: East Prussia 678; West Prussia 12,497; Brandenburg, etc., 692; Rhine Province and Westphalia 1,289, making a total of 15,156 Mennonites (souls). In the Rhine Province alone in 1812-1827, in the government district of Düsseldorf (Krefeld, etc. ), Aachen, and Cologne, there were about 883; of Coblenz (Neuwied, etc., and Trier) about 353, including some Amish, making a total of about 1,236 Mennonites (souls). As to the western provinces of Prussia, their different parts had belonged to various states and were only now united into a larger political body. Since the eastern provinces lived under older decrees, the government, after the Prussian military law of 1814 was promulgated, tried to find a similar status for those of the west. A first report was given by the Minister of the Interior in 1817, a second by a commission of the Royal Council in 1819 (Menno, several confessions including that of Dordrecht and that of Ris, the Latin history by Schijn, works on Mennonites by Zeidler in 1698, Rues in 1743, Crich-ton in 1786, and Starck in 1789, and other general works were cited). There was a lively correspondence between King Friedrich Wilhelm III and the Oberpräsident on the one side, with the congregations, especially Krefeld, on the other. Even a small Amish group at Offhausen (Altenkirchen district) received an answer from Chancellor Hardenberg. In 1826 the king ordered that all heads of Mennonite families be questioned about their position on nonresistance. In 1830 the law on the rights of the Mennonites (and Quakers) in the western provinces and Brandenburg was published. Most of the families asked accepted military service and thus became ordinary citizens. The smaller part refused military service, and were obliged to pay a special income tax of 3 per cent, were not allowed to acquire new property, and were admitted to communal, but not to state offices; new settlements were forbidden. Thus the new legal status was established. In the North as well as in South Germany many, particularly the Amish, immigrated to America in 1830-1860, particularly from Nassau, Hesse, and Waldeck. Among those who remained in Germany there were frequently cases—at Friedrichstadt, at Hamburg-Altona, and in the 1820's even at Krefeld—when individuals more or less successfully tried to evade military service. In Hamburg occurred the remarkable case that in 1818 a Mennonite Lieutenant Jansen complained to the military authorities of being excommunicated by the congregation on account of his military service; it was rather surprising to him that the authorities advised him to return to civilian life. Yet the Hamburg congregation lost ground notwithstanding. Whereas in 1837 they had asserted that substitutes were as objectionable as personal service, by 1851 they had to be satisfied with avoiding personal service by the use of substitutes. Little by little, as in South Germany, the attitude of the Mennonites in North Germany concerning nonresistance changed. Already in 1831 the congregations of East Friesland (in 1815-1866 belonging to the Kingdom of Hanover) had relinquished this principle, as they then officially declared to the authorities. In 1848 the first German parliament in the Paulskirche at Frankfurt became something like another turning point in nonresistance. A Mennonite banker of Krefeld, Hermann von Beckerath (1801-1870), a member of diis parliament (and of the Prussian parliament as well) and of its committee for the constitution and even one of its ministers, discussing the fundamental laws, on 28 August declared: "I think myself fortunate in belonging to one of the freest denominations. The time of privileges is gone. The modern state requires equal rights for all citizens. So the Rhenish Mennonites with only few exceptions are rendering their military service. Nonresistance with them is no longer an integral part of their creed." So an amendment in favor of nonresistance for the Mennonites offered by the members from Danzig was lost. Many applauded: a real confession! Indeed, these Mennonites of West and South Germany now regarded nonresistance no longer as a fundamental article of their creed, but as a privilege no longer tolerable because it was injurious to the rights of fellow citizens. In 1867 even the conference of Offenthal (near St. Goarshausen on the Rhine in Nassau), where Mennonites and Amish of the Palatinate, Neuwied, Nassau, and Hesse (the duchy of Nassau and the electorate of Hesse having just been added to Prussia) met to come to an agreement, though confessing nonresistance as an article of the creed, ruled: "But how each congregation and each young man will indeed prove our old-Mennonite nonresistance, in order to satisfy his own conscience and the demands of the authorities, we leave to the judgment of each of them." This was the formula later often repeated to save the principle and at the same time abandon it. The situation in Prussia proper was more fortunate. In the same year (1818) when at Hamburg Lieutenant Jansen sought in vain to return to his congregation in spite of his military service, the same thing happened to a David van Riesen of Elbing who had served in the Wars of Liberation and had nevertheless also tried to return to his congregation with the help of the courts. The emigration to Russia from 1788 on alleviated the economic difficulties (as the buying of property here was also limited) for those who remained. Besides, the "everlasting" privilege of 1780 gave a matchless support. But after 1848 the Mennonites of Prussia proper also had to realize the change of the times. There was the new Prussian constitution which proclaimed equal rights and equal duties for all (5 December 1848). At Frankfurt in August 1848 the Danzig members of the parliament (Martens and Osterrath) had in vain pleaded for the Mennonite privilege of nonresistance, pleading for tolerance. The West Prussian congregations met on 14 September 1848, at Heubuden and sent a petition to Frankfurt to recognize their convictions, but in vain. At Berlin in February 1849 delegates of the congregations met the Prime Minister of Brandenburg and at least obtained a postponement. But the discussions about the nonresistance of the Prussian Mennonites, their special tax and their limitations in buying new property continued. Peter Froese (d. 1853), elder of Orlofferfelde 1830-1853, wrote a pamphlet in 1850 once more defending nonresistance as an article of the Mennonite creed, and Wilhelm Mannhardt (1831-1880), the noted folklorist, in 1863 did the same by means of thorough historical research (Die Wehrfreiheit der Altpreussischen Mennoniten). Even in 1867 the Prussian government proposed, in a bill concerning military service, exempting the members of those Mennonite and Quaker families who by laws or privileges were released from direct service, but obliging them to furnish an equivalent. Yet on 18 October 1867 the first Imperial Diet of the North German Confederation (the nucleus of the later German Empire) rejected this paragraph so that now all Mennonites had to serve in the army. Gerhard Penner (1805-1878), the elder of the Heubuden congregation 1852-1877, was informed of this vote the same day by wire. On the 23rd representatives of the Prussian congregations met in his house at Warnau (Koczelitzky) and a delegation of five set out at once for Berlin and on the 24th called on the Minister of War (Roon). Nevertheless the law was published on 9 November 1867. Summoned by the members of parliament of their region in February 1868 the five traveled to Berlin once more and for a whole week (18-26 February) called on the king and the crown prince, ministers and privy councilors, members of the parliament, etc. Most impressive was what the crown prince said; viz., that the whole royal house was trying to help them; he warned them against emigration to Russia and advised them at least to reserve a return for their children, as probably in Russia matters would soon turn the same way. In this very week, on 20 February, the ministers of War and of Interior in a common report recommended that the members of the older Mennonite families who were not willing to serve with arms might be trained as nurses, wagoners, etc., only. These proposals were sanctioned by the Order of Cabinet of the king on 3 March 1868. As a consequence of the new course the limitation as to property and the special tax on the Mennonites were rescinded. The Prussian Mennonites reacted in several ways to these transactions and decisions. A smaller part immigrated to Russia (1853 f.) and to America (1873 f.). Those remaining were divided into a group which strongly clung to the Order of Cabinet, and another which was willing to serve with arms. The congregation of Montau-Gruppe was split into two for half a century on this question. In 1909-1914, of the 200 young Mennonites of Prussia proper in contact with their congregations nearly one half followed the Order of Cabinet, and the rest served with arms. In this respect for West and East Prussia World War I signified the end of nonresistance. In 1933 when the curatorium of the Vereinigung discussed the question of a new universal compulsory service nobody proposed asking for another "privilege." Even the confession of faith of the Mennonites in Prussia (1895), which forbade revenging oneself on one's neighbor, merely urged its members as far as possible to avoid the outrages of war. The German martyrs of nonresistance in World War II included only one Lutheran and many Jehovah's Witnesses, but no Mennonites. After the war American and Dutch Mennonite influences, as well as the impressions of the war, resulted in a new nonresistant trend. The new German constitution of 1950 made provision for alternative service for conscientious objectors. As to the problem of the oath, regulations exempting Mennonites in the courts and as officials were made in Württemberg in 1807, in Bavaria in 1811, in Nassau in 1822, in the older provinces of Prussia in 1827, etc. Under Hitler it was rather easy to get such exemptions for soldiers in the army as early as 1935. But in certain other respects there was a long struggle, the oath being regarded by the National Socialists as a special foundation of the state; hence many had to render an oath, as the authorities ordered, even by radio, and many did so without scruples, although ultimately the requirement was waived for Mennonites. As to public offices, for the 19th century at least two South German Mennonites may be named besides Hermann von Beckerath in the North, namely, Peter Eymann (1788-1855), a miller of Sembach (Palatinate), assistant preacher of his congregation, who was mayor of Frankenstein and in 1849 a Liberal member of the Bavarian parliament, and Jakob Finger (1825-1904), a lawyer of Monsheim (Hesse), in 1862-1865 a member of the Hessian parliament and in 1884-1898 minister of state. A look at the Mennonite Adressbuch of 1936 revealed all the difficulties of the question of office-holding in a modern state such as Germany. Mail, telegraph, and railways were managed by the state, and many schools and libraries also. But was working in them a public office in the sense of earlier times? And if we found a good many Mennonites in these offices, what about Mennonites in the administration of customs or in the revenue department? But then it was only a step to the courts and the police and then again only one more to serving as captain or admiral. At any rate, the principle of avoiding public offices was nearly forgotten. Sometimes and in some places (Berlin, Krefeld) there were Mennonites in an amazing number of public offices. In 1874 a Prussian law allowed Mennonite congregations to incorporate. After 1924 Gustav Reimer (1884-1955) in a series of lawsuits liberated the Mennonites of Prussia proper (including the Free City of Danzig) from the obligation of paying taxes to the Protestant established church. As to nonconformity nobody wanted to be very conspicuous, different, or shocking. At the end of the 19th century nonconformity was gradually dropped even by the Amish. On the other hand, even between the world wars, e.g., 1918-1939 in the Palatinate, it was a problem whether girls might be allowed to bob their hair. Sometime later even the older women had bobbed hair. Technical progress often did away with traditional fashions. Thus the world overcame nonconformity. But also spiritual influences of the surrounding life helped to bring about change in the character of the Mennonite congregations in Germany. There was the Reveil in Holland in the early 19th century with its interest in missions and Bible distribution. Even in Krefeld in 1818-1834 the minister Isaac Molenaar (1776-1834), in close contact with Holland, was a spokesman of this renewal of Pietism. The English Baptist William Henry Angas (d. 1832) visited West Prussia in 1823 and the Palatinate in 1824 to make propaganda for the missions which the Baptists had started with William Carey in 1792. The Basel Mission (founded in 1815) in the South, the Berlin Mission (founded in 1824) in the North, and later (1847 ff.) the Mission of the Dutch Mennonites also were supported by the offerings of the German Mennonites. In the 1950s there was a German Mennonite Committee for Missions as a branch of an all-European Mennonite Mission Board. There was the "Gemeinschaftsbewegung" in the late 19th century with its Gospel songs which won the South more or less, in West Prussia particularly the Thiensdorf-Preussisch Rosengart congregation. Pietistic influences in general came especially from St. Chrischona (founded in 1840) and many similar schools. From 1858 on the Hahnsche Pietists of Württemberg with their universalism reached two congregations of Baden. As the Northwest German congregations (Lower Rhine and East Friesland) were in character like the Dutch congregations, quite different influences are found here. From the Netherlands and from the universities rationalism, liberalism, and modernism found their way into these congregations. Gustav Kraemer (1863-1948) in Krefeld (from 1903) and J. G. Appeldoorn (1862-1945) in Emden (1904-1916) were prominent representatives of these tendencies, the one coming from the German Protestant Church, the other from Holland, to which he later returned. A milder liberalism had appeared earlier in Prussia proper with Carl Harder (1820-1896), pastor at Neuwied 1857-1869 and at Elbing in the progressive town congregation 1869-1896, and with Hermann Gottlieb Mannhardt (1855-1927), pastor at Danzig from 1879. In general confessional boundaries became lax in certain areas. So we found non-Mennonite pastors of Mennonite congregations (Krefeld, Monsheim), and the opposite as well (Kiel). The pietistic wing of the German Mennonites since 1857 was in constant contact with the Evangelical Alliance, represented for instance by Pastor H. van der Smissen of Hamburg. The South German Conference was represented at the World Conference for Faith and Order at Lausanne, Switzerland, in 1927 (Benjamin H. Unruh). The Vereinigung belonged officially after 1930 to the World Alliance for International Friendship through the Churches. In 1947-1948 the Vereinigung became a member of the World Council of Churches and one of the founders of the Committee of Christian Churches in Germany. In the World Council meeting at Amsterdam in 1948 it was represented (Ernst Crous and Otto Schowalter). It must be admitted that there was a great change from the 16th-century Anabaptists to the 19th-century Mennonites and from the old Mennonites to the modern Mennonites in the 19th century. But we may also acknowledge that these changes in some respects at least have been helpful. We cannot deny that the little river ran through the centuries again and again in several smaller branches and two bigger ones, that the number of Mennonites in Germany absolutely and relatively diminished, and that much of the best substance was lost by so many emigrations. But it is nevertheless a fact that even under such conditions until the mid-20th century the Anabaptist-Mennonite vision, old and new, has in one way or the other accomplished something in the brotherhood. In economic life it is worth noting that numerous Mennonites of the city congregations of Krefeld, Emden, Gronau, Hamburg, and Danzig became successful and wealthy merchants and manufacturers, but that the Mennonites of West Prussia and South Germany remained essentially farmers and achieved a splendid reputation in this field. Source: Mennonite Encyclopedia, v. 2, pp. 484-485. Mennonites in the Bundesrepublik Deutschland (BRD; Federal Republic of Germany) can be divided into six groups: (1) "urban Mennonites " of the north and west; (2) descendants of Swiss immigrants in the south; (3) West Prussian refugees, who for the most part are living in northern Germany in their second generation; (4) approximately 700 return emigrants, who came from Paraguay and Uruguay since the 1960s; (5) more than 3,000 Umsiedler (resettlers), who arrived from the Soviet Union in the 1970s; (6) ca. 800 Mennonites in congregations resulting from Mennonite Brethren and Mennonitische Heimatsmission (MHM) mission work. The differing backgrounds of these groups has made "coming together" difficult. The four German Mennonite conferences vary in the roles they fill. In general, their functions include: publication of periodicals; continuing education for church workers; organization of conferences; support and encouragement of congregations, missions, and social projects; the peace witness; and representation before state, society, and other denominations. The Vereinigung Deutscher Mennonitengemeinden (VdM; Union of German Mennonite Congregations) includes 34 congregations, with 7,248 members in the north and west as well as in the Palatinate. The Verband deutscher Mennonitengemeinden (VdM; Federation of German Mennonite Congregations) has 22 congregations and 1,617 members in Baden-Württemberg, Bayern ( Bavaria), and the Palatinate. The two Mennonite Brethren conferences (Arbeitsgemeinschaft Mennonitischer Brüdergemeinden in Deutschland and Arbeitsgemeinschaft Mennonitischer Brüdergemeinden in Osterreich and Bayern) include 938 members in eight congregations within the Federal Republic. Ten Umsiedler congregations, with 2,183 members, have neither joined an existing conference nor organized their own; they are connected among themselves and with other congregations through the Arbeitsgemeinschaft zur geistlichen Unterstützung in Mennonitengemeinden (Task Force for Spiritual Aid in Mennonite Congregations). For 1987, the Mennonitisches Jahrbuch lists 81 Mennonite congregations and three mission projects by MHM, two by Deutscher Mennonitisches Missionskomitee (DMMK), and one by Rosedale Mennonite Mission (Conservative Mennonite Conference). Altogether, these add up to 11,335 members, not including children or guests. Congregational size varies from 15 to 1,170 members. Geographical concentrations exist in the Palatinate (18 congregations, 2,600 members), the Bielefeld area (5 congregations, 1,858 members), Espelkamp (3 congregations, 1,555 members), and Neuwied (4 congregations, 1,078 members). Roughly calculated, Mennonites in the Bundesrepublik can be categorized as one-fourth "West Prussian," one-fourth "Swiss," one-third "Russian," one-twelfth urban, and one-twelfth not of Mennonite background. If the total figure is compared with that of 1933, a one-third decline is revealed; however, if those of Russian Mennonite heritage are not figured in, it becomes evident that Mennonites in Germany declined by more than one-half during that period. Every sector of German Mennonites is faced with this. Along with this dramatic decline, structural changes have taken place since World War II. After the flight and expulsion of West Prussians and during the beginnings of return emigration from South America and resettlement from the Soviet Union, more and more rural Mennonites in the southern Bundesrepublik left their villages and farms for the cities. Opportunities for young people in agriculture diminished due to structural shifts in that field; at the same time, the educational system improved, broadening the spectrum of professional opportunities. The demands of professional mobility brought many young Mennonites to cities without Mennonite congregations. The customary relationship of profession and congregation was lost; a steady shrinking of congregations resulted. In addition, the number of marriages in which one partner either was a stranger to the Mennonite world or had other confessional ties increased. As patriarchal structures weakened, the extended family lost its hold. The Mennonite "family church" was no longer the natural home, no longer provided the sought-after shelter and protection. Most young Mennonites were finding themselves on their own in a strange environment. Due to these shifts, numerous congregations have been founded in small and middle-sized cities since 1945. In the late 1980s, there were as many "new" congregations (40 with 5,468 members) as "old " ones (41 with 5,867 members). In recent years, many congregations have been able to buy or build meetingplaces; in 1986 more than half of the congregations owned the building in which they met. Based on the frequency of congregational events, on involvement reaching outside the congregation, and on the findings of church workers, congregations with their own buildings are especially active. More than 100 lay preachers (119, not including MHM) and 23 salaried ministers serve Mennonite congregations; eight church workers are also employed in various projects (not including the staff of the four homes for the elderly in Thomashof, Burgweinting, Enkenbach, and Bad Oldesloe). The training of the salaried pastors varies considerably: some have attended a Bible school, others have studied at independent theological academies, and eight have university degrees in theology. Seven also supplemented their ministerial training through courses at Mennonite seminaries or colleges in North America. Forty-seven of the lay ministers are with VdM, and 28 are with the Umsiedler congregations. In recent years, the readiness of laity to deliver sermons has also been increasing in many predominantly West Prussian congregations. An important task in coming years will be further training of lay ministers. However, many congregations still have difficulty finding lay persons who will preach. Some smaller congregations no longer have a minister, and others have no replacement leadership under training. A number of congregations meet for worship only every two to four weeks. Nine of the salaried ministers serve two or more congregations. There are many other congregations in which the number of weekly events has increased, and in which consistent work with congregational subgroups (the elderly, youth, young adults, etc.) has been growing. Such a variety of offerings in a congregation is not possible without strong lay involvement. Because of their diverse backgrounds and situations, Mennonites in the Bundesrepublik present a picture rich in variety. There are "conservative" Mennonites as well as those looking for new forms and directions; here a congregation influenced by evangelistic renewal, and there one more interested in the peace witness. The social spectrum has changed; the number of farmers has gone down and social and service professions have become more popular, while the Umsiedler—due to their background—frequently find employment as industrial workers. Founded on 7 October 1949, the Deutsche Demokratische Republik (German Democratic Republic, East Germany) comprised the area of the post-World-War-II Soviet zone of occupation. Its social, political, and economic systems were modeled on those of the Soviet Union under Stalin. After 1949 the Socialist Unity Party (SED), governing according to the principles of democratic centralism, remained virtually unchallenged in its control. Economically and socially weakened by heavy emigration to West Berlin, the DDR built a wall to seal off West Berlin from the surrounding territory of the DDR (1961). In 1971 the communist party leader, Walter Ulbricht, was replaced by Erich Honecker, who, while strengthening ties to the Soviet Union, was also responsive to the needs of the people. A new treaty with the Bundesrepublik Deutschland (BRD, Federal Republic of Germany [West Germany]), ratified the next year, moved towards normalization of relations and increased contact between the two Germanys at many levels. The economic and social stability of the German Democratic Republic increased significantly during Honecker's time in power. In 1985 the country had a population of 16.7 million. During the early years of the DDR's existence church-state relations were often confrontational. This situation peaked in 1953 with widespread harassment and some arrests. The state had introduced clubs for children and youth, and also the Jugendweihe -- a socialist youth initiation at the traditional age of church confirmation. In 1969 the Evangelische Kirche (the main Protestant [Lutheran-Reformed] body) in the DDR separated from the inter-German Protestant union (Evangelische Kirche in Deutschland). The leadership of this church sought to be a "church within socialism," not beside it, and not against it. This stance of critical solidarity was combined with an appeal to the humanistic core of communism. On 6 March 1978 leaders of the Protestant Church met with Honecker. One result was the expansion of the role of the church in the society. Numerous educational institutions, hospitals, and homes for the elderly and the disabled were supported by the church. The Protestant Church was also known for its active involvement in international ecumenical work. The cooperation of the church with the state in the celebration of the 500th anniversary of Martin Luther's birth in 1983 was positively evaluated by many. However, the unequal treatment of Christians in the education system, repeatedly addressed at church synods in 1985 and 1986, was not resolved. Statistics for 1983 showed the Protestant Church with 6,950,000 members, the Roman Catholic Church with 1.2 million, and the free churches and fellowships with 150,000. Membership had declined steadily in the two large churches, and active membership was substantially lower. Political events throughout 1989 in East Germany, including mass demonstrations, led to the opening of the Berlin Wall on 9 November 1989. 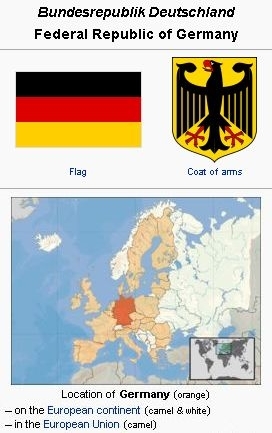 Germany was formally reunited on 3 October 1990. The literature of the Mennonites in Germany, excluding the 16th-century Anabaptists and omitting small pamphlets and ephemeral literature, falls into six categories: (1) reprints of Dutch Mennonite books; (2) sermon collections; (3) devotional literature and church manuals such as confessions, catechisms, and prayerbooks; (4) historical writings; (5) hymnbooks, and (6) general theological and Biblical literature. Of the last category remarkably little was produced by native German Mennonites; they seem to have produced no substantial general writers throughout their history. The entire list includes only five writers: (1) Gerhard Ewert, Gross-Lunau near Culm (Sieben Betrachtungen, 1843); (2) Peter Froese, elder at Orlofferfelde (Liebreiche Erinnerung . . . von der Wehrlosigkeit, 1850); (3) Karl Harder, preacher at Neuwied and Elbing, who published (with the help of others) three volumes of Blätter für Religion and Erziehung, 1869-1871; (4) Philipp Kieferndorf, preacher at Monsheim (Der Eid, 1891); and (5) Horst Quiring, preacher at Berlin (Grundworte des Glaubens, 1938, a theological dictionary). Jakob Kroeker (1872-1948), an outstanding writer with over 20 titles of quality to his credit (e.g., Das lebendige Wort, 14 vols of Old Testament exposition), was a Russian Mennonite who came to Germany permanently in 1910 and served as an interdenominational speaker and writer without membership in any German Mennonite group. The list of German translations of Dutch Mennonite authors is extensive: Menno Simons, Ein Fun damentbuch (n.p., 1575; 2nd ed. undated), Die Fundamente (Danzig, 1835), translated by P. van Riesen, Ausgang aus dem Papsttum (Frankfurt and Leipzig, 1700), and Kurzer Auszug (Büdingen, 1758 and Königsberg, 1765); Dirk Philips, Enchiridion (1715, with three smaller tracts) and Von der Ehe der Christen (1765); T. J. van Braght, Tugendschule (1743) and Märtyrer-Spiegel, reprinted from the Ephrata, PA, 1748 edition at Pirmasens in 1780; H. Schijn, Erster Anfang von dem christlichen Gottes dienst (1743); J. Deknatel, Anleitung zum Christ lichen Glauben, a catechism (Amsterdam, 1756; reprints Neuwied 1790, Worms 1829, Alzey 1839); two confessions: (a) Dordrecht of 1632 in German first at Amsterdam, 1664 and 1691, then n.p., 1686, 1711, and 1742, further at Zweibrücken in 1854 and Regensburg in 1876; (b) Cornelis Ris confession of 1766 at Hamburg 1776 and 1850; the first (a) be coming the confession of the Amish, the second (b) that of the North German Mennonites. Deknatel's sermons were also published in German translation at Büdingen in 1757. J. P. Schabalie's famous Wandelnde Seele had at least nine European German editions, among them Basel 1741, 1770, 1811, Frankfurt and Leipzig 1758, 1770, and 1860. The printed sermon collections were fairly numerous, seventeen of more than two sermons being listed in 1730-1909 in the exhaustive "Annotated Bibliography of Published Mennonite Sermons" (Mennonite Quarterly Review 27 (1953): 145-149), beginning with Jakob Denner of Hamburg and including Rahusen of Leer, I. Kroeker of Königsberg, Leonhard Weydmann and Isaac Molenaar of Krefeld, J. A. Hoekstra of Hamburg, H. Reeder of Weierhof, J. Molenaar of Monsheim, C. Harder of Neuwied and Elbing, H. G. Mannhardt of Danzig, J. P. Müller of Emden, and three series of sermons by various preachers (Menn. Bl. supplements 1887-89, Predigten aus Mennoniten-Gemein-den i8gi-gg, 9 vv., and Predigten vorgetragen in den Mennoniten Gemeinden Westpreussens 1906-09. The devotional literature and church manuals include, besides the Dordrecht and Cornelis Ris Dutch confessions and Deknatel's Dutch catechism, the following confessions and catechisms: the first German confession (possibly translated from the Dutch) of 1660 at Danzig (United Flemish, Frisian, and High German Mennonites), Confession oder Kurtze und Einfältige Glaubensbekentniss, to which were attached beginning 1690 the catechism Kurtze Unterweisung and Formular etlicher christlicher Gebete; another West Prussian Confession oder Kurtze und Einfältige Glaubensbekenntniss of 1678 (Georg Hansen, elder of the Danzig Flemish congregation); Glaubens-Bericht vor die Jugend of 1671 (the first German publication of its sort) and Erklärungen der Antworten of 1678 (both also written by Georg Hansen); Confession or Kurtzer und einfältiger Glaubens-Bericht der (Danziger) Alten Flämischen of 1768 (comprising the confession of 1730 and the catechism of 1768); the very popular Elbing catechism of 1778 of the Flemish elder Gerhard Wiebe (Elbing) and the Frisian elder Heinrich Donner (Orlofferfelde), Kurtze und Einfältige Unterweisung, which became the catechism of the Amish and, reprinted first at Waldeck (1797), was often called the "Waldeck catechism," with many German reprints for the Amish, four French editions, and many editions in America as well as many reprints in West Prussia and numerous reprints in Russia; the confession of Gerhard Wiebe (1792) and the new West Prussian of 1895. Gerrit Roosen's justly popular Christliches Gemütsgespräch (Ratzeburg, 1702), which went out of use in Germany after 1838 but was widely used in America (14 German editions, 1769-1938, and 6 English editions, 1857-1941); attached to the Gemüthsgespräch, strangely enough, was the Prussian catechism of 1690, Kurtze Unterweisung; Leonhard Weydmann's Christliche Lehre (Monsheim, 1836, and Crefeld, 1852); Johannes Molenaar's Katechismus der christlichen Lehre (Leipzig, 1841); the Christliches Lehrbüchlein of the Verband (Heilbronn, 1865). (For a complete account of all German confessions and catechisms see the articles "Confessions, Doctrinal" and "Cathechism" in this Encyclopedia.) The chief prayerbook was the Ernsthafte Christenpflicht, first published at Kaiserslautern in 1739, reprinted many times in Germany, 1753, 1781 (Pirmasens), 1787 (Herborn), 1796, 1816 (Zweibrücken), 1832 (Basel), 1837 (Zweibrücken), 1840 (Reinach), and 1852 (Regensburg), and many editions in America, largely used by the Amish. (For a fuller discussion of prayerbooks and devotional literature see Friedmann, Mennonite Piety, particularly the chapters "Mennonite Prayer-books, Their Story and Meaning" and "The Devotional Literature of the Mennonites in Danzig and East Prussia."). The hymnbooks of the German Mennonites were basically few in number. In 1564 was published Etliche schöne Christliche Geseng, wie sie in der Gefengkniss zu Passaw im Schloss von den Schweitzer Brüdern durch Gottes gnad geticht vnd gesungen worden. About the same time, probably 1563/64, in the Lower Rhine area was published Ein schön Gesangbüchlein Geistlicher Lieder, zusammen getragen auss dem Alten und Neuen Testament durch fromme Christen vnd Liebhaber Gottes, reprinted twice with additions, the third edition being made by Leenaert Clock. Since 1583 the first of these hymnals is the second part of the Ausbund, whereas a number of hymns of the second hymnal appear in the first part of the Ausbund, which has become the hymnal of the Amish (first edition with this title 1583, n.p., 2nd ed. 1622, n.p., with later editions probably all at Basel, last there in 1838). The first German hymnbook of the Prussian Mennonites (they had used Dutch hymnals before) was the Geistreiches Gesangbuch (Königsberg, 1767), which went through 9 German editions, last at Elbing in 1843, and went on to long use in Russia, Manitoba, and Mexico where it was still being used in the 1950s. Meanwhile it was replaced in West Prussia by a new book, Gesangbuch für Mennoniten-Gemeinden in Kirche und Haus (1869, with its 5th ed. in 1922). The Danzig congregation had its own hymnal from 1780 on, also called Geistreiches Gesangbuch, displaced in 1854 by a new book called Gesangbuch zur kirchlichen und häuslichen Erbauung, reprinted in revised form in 1908. The Northwest German congregations long used Dutch Mennonite hymnals and then replaced them with modern state-church books. But the South Germans, after first using state-church hymnals, created their own hymnbooks. The first one, Christliches Gesangbuch, appeared at Worms in 1832, with a revised edition at Würzburg in 1839. The second and final one, Gesangbuch zum gottesdienstlichen und häuslichen Gebrauch, appeared at Worms in 1854, with new editions in 1876, 1910 (revised), and 1950. A separate book was published by the Amish in Hesse and neighboring areas at Wiesbaden in 1843 (reprint Regensburg, 1859), under the title Gesangbuch zum Gebrauch bei dem öffentlichen Gottesdienst. . . .The hymns in all these books were largely taken from the older German treasury of hymns and chorales, with few additions of the late 19th-century "Gospel song" type (see Hymnology). Brons, Antje. Der Ursprung, Entwicklung und Schicksale der Taufgesinnten oder Mennoniten. Norden, 1884, new ed. 1891 and 1912. Dornkaat Koolman, J. t. Kurze Mitteilungen aus der Geschichte der Mennoniten-Gemeinden in Ostfriesland. Norden, 1903. Dornkaat Koolman, J. t. Mitteilungen . . . Gemeinde zu Norden. Norden, 1904. Händiges, E. Die Lehre der Mennoniten in Geschichte und Gegenwart. Kaiserslautern, 1921. Hege, Christian. Die Täufer in der Kurpfalz. Frankfurt, 1908. Hege, Christine. Kurze Geschichte der Mennoniten. Frankfurt, 1909. Mannhardt, H. G. Die Danziger Mennonitengemeinde. Danzig, 1919. Mannhardt, Wilhelm. Die Wehrfreiheit der Altpreussischen Mennoniten. Marienburg, 1863. Müller, J. P. Die Mennoniten in Ost-Friesland. 1881 and 1887. Neff, Christian, ed. Gedenkschrift zum 400jährigen Jubiläum der Mennoniten. Ludwigshafen, Germany, 1925. Neff, Christian. Ein Rückblick auf 400 Jahre Mennonitischer Geschichte. Karlsruhe, 1935. Penner, Horst. Ansiedlung Mennonitischsr Niederländer im Weichsel-Mündungsgebiet. Karlsruhe, 1940. Penner, Horst. Weltweite Bruderschaft, Ein mennonitisches Geschichtsbuch. (Karlsruhe, 1955. Quiring, Walter. Deutsche erschliessen den Chaco. Karlsruhe, 1936. Quiring, Walter. Russlanddeutsche suchen eine Heimat. Karlsruhe, 1938. Roosen, B. C. Geschichte der Mennoniten-Gemeinde zu Hamburg und Altona, 2 vols. Hamburg, 1886-87. Stobbe, L. Montau-Gruppe. Montau, 1918. Unruh, Benjamin Heinrich. Die niederländisch-niederdeutschen Hinter gründe der mennonitischen Ostwanderungen im 16., 18. und ig. Jahrhundert Karlsruhe, 1955. Weydmann, E. Geschichte der Mennoniten bis zum 18. Jahrhundert. Neuwied, 1905. Wiebe, Herbert. Das Siedlungswerk niederländischer Mennoniten im Weichseltal. Marburg, 1952. The greatest historical work of the German Mennonites has been the Mennonitisches Lexikon (1913-1967) edited by Christian Hege and Christian Neff, since 1947 by E. Crous (and H. S. Bender), in 1956 at the letter R. The publications of the Mennonitischer Geschichts verein (MGV) (founded 1933), edited by Christian Hege and since 1950 by Horst Quiring (Mennonitische Geschichtsblätter 1936-, and Schriftenreihe des Mennonitischen Geschichtsvereins 1938-) have been notable. The Mennonite Research Center at Göttingen, directed by Ernst Crous, was created by the MGV in 1948. Bender, Harold S. and John Horsch. Menno Simons' Life and Writings. Scottdale, PA: Mennonite Publishing House, 1936. Bender, Harold S. Bender. "The Zwickau Prophets, Thomas Miintzer and the Anabaptists." Mennonite Quarterly Review 17 (1953): 3-16. Bossert, Gustav. Quellen zur Geschichte der Täufer I. Band, Herzogtum Württemberg. Leipzig: M. Heinsius, 1930. Cattepoel, D. "Mennonites of Germany 1936-1948, and the Present Outlook." Mennonite Quarterly Review 24 (1950): 103-110. Crous, Ernst. "Mennonites in Germany since the Thirty Years' War." Mennonite Quarterly Review 25 (1951): 235-262. Dollinger, R. Geschichte der Mennoniten in Schleswig-Holstein, Hamburg und Lübeck. Neumünster, 1930. Franz, Günther. Urkundliche Quellen zur hessischen Reformationsgeschichte. Vierter Band, Wiedertäuferakten 1527-1626. Marburg: N.G. Elwert, 1951. Friedmann, Robert. Mennonite Piety Through the Centuries. Goshen, IN: Mennonite Historical Society, 1949. Friedmann, Robert. "Spiritual Changes in European Mennonitism, 1650-1750." Mennonite Quarterly Review 15 (1941): 33-45. Hege, Christian. "Early Anabaptists in Hesse." Mennonite Quarterly Review 5 (1931): 157-178. Hege, Christian and Christian Neff. Mennonitisches Lexikon, 4 vols. Frankfurt & Weierhof: Hege; Karlsruhe: Schneider, 1913-1967: v. I, 422-429. Horsch, John. Mennonites in Europe. Scottdale, PA: Mennonite Publishing House, 1942. Krahn, Cornelius. Menno Simons. Karlsruhe, 1936. Littell, F. H. The Anabaptist View of the Church. 1952. Mennonite World Conference. "2000 Europe Mennonite & Brethren in Christ Churches." Web. 27 February 2011. http://www.mwc-cmm.org/Directory/2000europe.html. [Broken Link]. Mennonite World Conference. "Europe." Web. 5 October 2008. http://www.mwc-cmm.org/Directory/2006europe.pdf. [Broken Link]. Mennonite World Conference. World Directory = Directorio mundial = Répertoire mondial 2012: Mennonite, Brethren in Christ and Related Churches = Iglesias Menonitas, de los Hermanos en Cristo y afines = Églises Mennonites, Frères en Christ et Apparentées. Kitchener, ON: Mennonite World Conference, 2012: 14-15. Neff, Christian. "Mennonites of Germany, including Danzig and Poland." Mennonite Quarterly Review 11 (1937): 34-43. Newman, A. H. A History of Anti-Pedobaptism . . .to 1609. Philadelphia, 1897. Penner, Horst. "Anabaptists and Mennonites of East Prussia." Mennonite Quarterly Review 22 (1948): 212-225. Rembert, Karl. Die "Wiedertäufer" im Herzogtum Jülich. Berlin: R. Gaertners Verlagsbuchhandlung, 1899. Schornbaum, Karl. Quellen zur Geschichte der Wiedertäufer II. Band, Markgraftum Brandenburg. (Bayern I. Abteilung). Leipzig: M. Heinsius Nachfolger, 1934. Schornbaum, Karl. Quellen zur Geschichte der Täufer, V. Band (Bayern, II. Abteilung) Gütersloh: C. Bertelsmann, 1951. Smith, C. Henry. The Story of the Mennonites. Berne, IN, 1945. Wappler, Paul. Die Täuferbewegung in Thüringen von 1526-1584. Jena: Gustav Fisher, 1913. Wenger, John C. "Life and Work of Pilgram Marpeck." Mennonite Quarterly Review 12 (1938): 137-166. Wenger, John C. "The Schleitheim Confession of Faith." Mennonite Quarterly Review 19 (1945): 243-253. Wenger, John C. "Theology of Pilgram Marpeck." Mennonite Quarterly Review 12 (1938): 205-256. Wiebe, O. "Die Mennonitengemeinden in Nordwestdeutschland vor 10 Jahren und heute." Mennonitischer Gemeinde-Kalender (1956): 34-42. Wiswedel, Wilhelm. Bilder and Führergestalten aus dem Täufertum, 3 vols. Kassel: J.G. Oncken Verlag, 1928-1952. Foth, Peter J. "Mit hundert Jahren noch ein Kind—Wege und Umwege zur mennonitischen Einheit." Brücke 4 (1986). "Konferenzen Woher? Wohin? " in Mennonitisches Jahrbuch (1986). Kraybill, Paul N., ed. Mennonite World Handbook. Lombard, IL: Mennonite World Conference, 1978: 293-299. Mennonite World Handbook Supplement. Strasbourg, France, and Lombard, IL: Mennonite World Conference, 1984: 115-117. Zurich und Witmarsum nach Addis Abeba: Die Mennoniten in Geschichte und Gegenwart. Maxdorf, 1983. Beeson, Trevor. Discretion and Valour: Religious Conditions in Russia and Eastern Europe. London: Fount Paperbacks, 1982; Philadelphia: Fortress Press, 1982. Childs, David. The GDR: Moscow's German Ally. London: George Allen and Unwin, 1983. DDR Handbuch. 3rd. ed., 2 vols., ed. by Hartmut Zimmermann. Cologne: Verlag Wissenschaft und Politik, 1985. Hansen, Knuth. "Die Mennoniten-Gemeinde in der DDR." 1986. Copy of chapter prepared for future publication in the DDR. Hansen, Knuth. "Mennonitengemeinde in der DDR—Bilanz der letzten 5 Jahre." Report to the West Berlin Mennonite Church on 2 February 1985. Henkys, Reinhard, ed. Die evangelischen Kirchen in der DDR: Beiträge zu einer Bestandsaufnahme. Munich: Car. Kaiser Verlag, 1982. Henkys, Reinhard. Gottes Volk in Sozialismus: Wie Christen in der DDR leben. West Berlin: Wiehern Verlag, 1983. Kraybill, Paul N., ed. Mennonite World Handbook. Lombard, IL: Mennonite World Conference, 1978: 290-292. Mennonite World Handbook Supplement. Strasbourg, France, and Lombard, IL: Mennonite World Conference, 1984: 119. Sanford, John. The Sword and the Ploughshare: Autonomous Peace Initiatives in East Germany. London: Merlin Press/European Nuclear Disarmament, 1983. Travelling Information about the Evangelical Church in the German Democratic Republic. East Berlin: Press and Information Office of the Federation of Protestant Churches in the GDR, 1981. Weber, Hermann. DDR: Grundriß der Geschichte 1945-1981. Hannover: Fackelträger, 1982. Yoder, Bill. "Installation of New Pastor in East Berlin: Time for Reflection on Destiny." Gospel Herald (13 October 1981). Bender, Harold S., Diether Götz Lichdi and John Thiessen. "Germany." Global Anabaptist Mennonite Encyclopedia Online. May 2014. Web. 20 Apr 2019. http://gameo.org/index.php?title=Germany&oldid=161269. Bender, Harold S., Diether Götz Lichdi and John Thiessen. (May 2014). Germany. Global Anabaptist Mennonite Encyclopedia Online. Retrieved 20 April 2019, from http://gameo.org/index.php?title=Germany&oldid=161269. Adapted by permission of Herald Press, Harrisonburg, Virginia, from Mennonite Encyclopedia, Vol. 2, pp. 483-501; vol. 5, pp. 108-110, 227-228. All rights reserved. This page was last modified on 28 July 2018, at 19:02.